Diabetic mice are more susceptible to infection with S.
aureus. (A) Survival of C57BKS and db/db mice infected i.v. with 5 × 107 CFU S. aureus (n = 15 mice per group). (B) Survival of C57BL/6 control or STZ-treated mice infected i.v. with 5 × 107 CFU S. aureus (n = 20 mice per group). (C and D) Numbers of S. aureus CFU recovered from the kidneys 48 hours after infection. (E) Glucose levels in the blood of mice treated with rosiglitazone or DMSO (n = 10 mice per group). (F) Survival of db/db mice treated with rosiglitazone or DMSO for 7 days prior to infection with 5 × 107 CFU S. aureus (n = 20 mice per group). 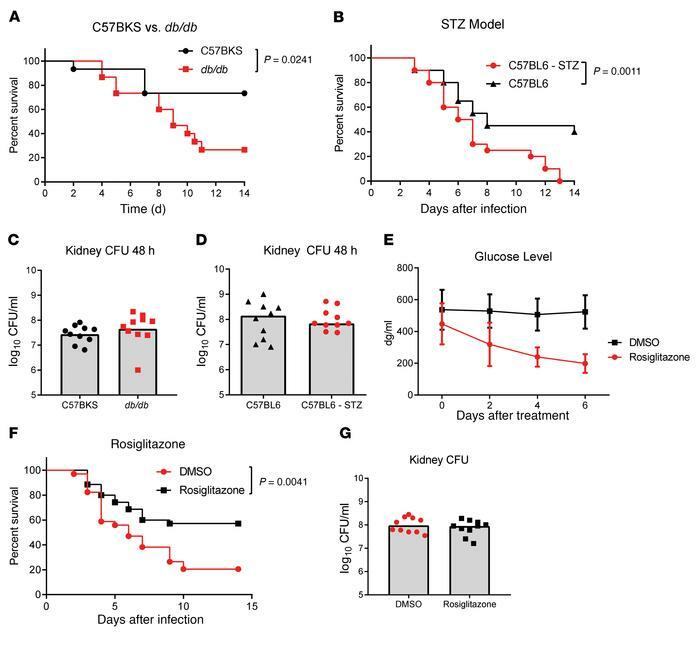 (G) Numbers of S. aureus CFU recovered from the kidneys of db/db mice 48 hours after infection. All data are representative of at least 3 independent experiments. Statistical significance was determined by log-rank test (A, B, and F) and Mann-Whitney U test (C, D, and G). Bars indicate the median.